Hi, I am interested in your 1964 Chevrolet Corvette (stock #5130-CHA) listed on Autotrader for $56,995. I'd like to get more information about this vehicle and confirm its availability. 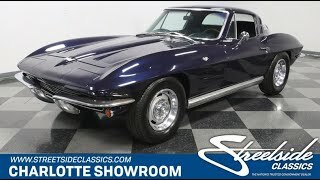 With a cool/rare color combo, four-on-the-floor, and a great original style right down to the V8 this 1964 Chevrolet Corvette coupe has all the right kinds of distinction. This is an actual miles couple, and it has only averaged around 980 miles in the last 55 years! So you know only something special can go all those years without pulling daily driver commuter duty. You can see that in the body, including where the hood lines up nicely and doors shut smoothly. And we know youre checking out the color. Daytona Blue was only offered for two years, so its great to see that any resprays have not strayed from the original dark hue. In fact, this retains all the right pieces you love, like the shining rally wheels, ribbed rocker panels, and mirror-like two piece bumpers front & rear. So this is certainly an icon of distinction. The factory-correct dark blue interior completes a total package that looks like the sky right after a late summer sunset. And these darker blues really do give this classic a nice modern flair compared to some other colors offered in 64. More than just have a nice look of originality, you can also tell this coupe was built to be a true drivers machine. Thats why you get bucket seats, a wood-rimmed sports steering wheel, and clear view of the full gauges. You just know that bright shifter is calling out for your right hand. Lift the hood, and youll find a beautifully honest 327 cubic-inch V8. This is the numbers-matching unit of the Sting Rays upgraded L76 motor. Topped with a correct Holley List 2818-1 four-barrel carburetor, this was built for higher compression and higher lift camshaft. It was rated from the factory at 365 horsepower, and only the expensive fuel-injected model was rated more powerful. On the road, this motor has the right amount of snarl through the newer dual exhaust pipes, and the control of the four-speed transmission really lets you experience this to the fullest. Plus, the recent investment in new bushings gives this a more connected feeling to the road thats heightened by the fully independent sports suspension. This is the strong-running Sting Ray with all the right distinctive features. And so at a price like this, youre looking at a very attractive deal. Call now!